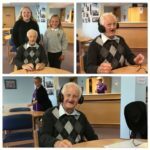 Our Rotakids have been working closely with Kingswood Day Centre creating musical memory playlists for some of the Service Users. The children have conducted interviews with the Service Users finding out their memories. They then collate this and create individual playlists which we download onto iPods for them. We presented Andy with his iPod this week and he was delighted.